Here is a look at some of my empty products from the past couple months. Starting off is the Revlon ColorStay Foundation in 230 True Beige which is a little dark for me at this time of the year but which is a perfect shade during the Summer. I’ve loved this foundation for years now, mostly during warmer months due to its long-lasting properties. I actually have another bottle of this but in a lighter shade which fits me more in the autumn months. Next is the Maybelline Flared Mascara, this is the non-waterproof version which I also love. I have used more than one tube of this but since I have bought the Waterproof version and at the moment I am using the Maybelline The Rocket Mascara which I find holds a curl really well. Maybelline is my favourite brand for mascaras and I always go back to them. I get mine from feelunique.com. Another product which I’ve used up multiple containers of, is the Essence Nail Art Express Dry Drops. I’m not very handy with nail art but I find this really helps my nail polish to dry quickly and leaves a nice sheen on the nails. I’ve already repurchased this and plan to get more as soon as that runs out. Another well-loved product but one which I find is a little overpriced for the amount you get is the Burt’s Bees Radiance Serum. This is an oil serum which you apply during the night and it is made from Royal Jelly which is made from bees. You only get 13ml in this little dropper for around €24 from feelunique.com, which is a little ridiculous but I have used multiple bottles of this. Next is the Green People Firming Eye Gel which is a great product if like me you get horrendous dark circles and puffy eyes. It works amazingly well under makeup too. Do you have any HG products for puffy eyes? Please do recommend. I have also finished my John Frieda Frizz Ease Shampoo, which I think I’ve used up a couple of these. However lately I have found that my hair feels a little dry and have switched up to a more moisturizing shampoo. 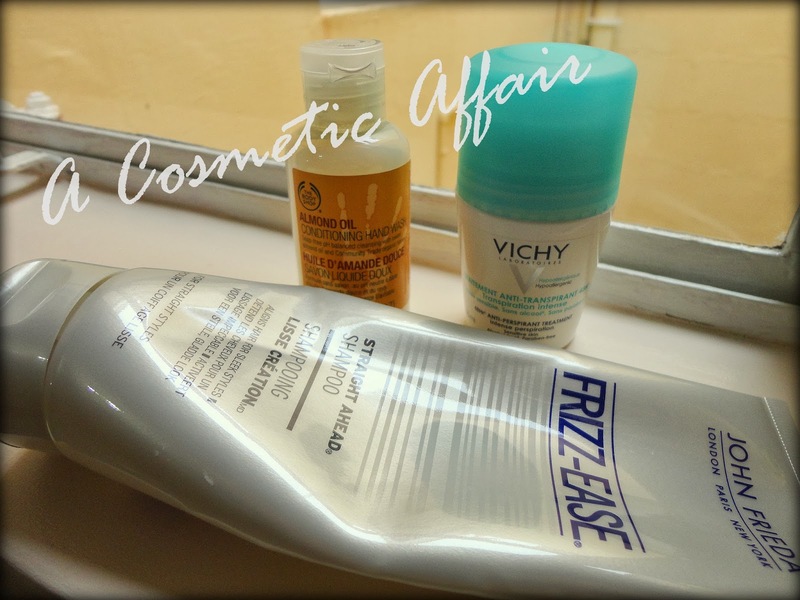 I also love the Vichy 48hr Anti-Perspirant Roll-On and I’ve gone through multiple bottles of these as I find them really gently for my sensitive skin. I get these from escentual.com. Lastly I went through my Body Shop mini sized Almond Oil Conditioning Hand Wash which I had got given as part of a gift set. Any products you’ve tried from this set of empties? Let me know if you like these kind of posts, as I love seeing what people use and what they loved or didn’t.